Hooked on Easy Piano Classics Volume 3 is an easy piano collection of favourite Classics that everyone wants to play. Volume three offers another easy to read and play piano arrangements of favourite piano solos and orchestral works from across the centuries. Titles include: Symphony No. 5 (Beethoven); Happy Farmer (Schumann); Habanara (Bizet); pomp and Circumstance (Elgar); Wedding March (Mendelssohn) and many more. 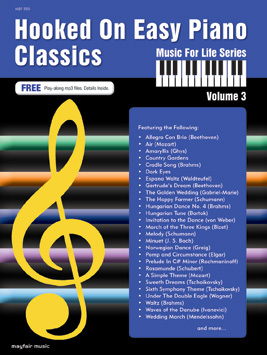 Every pianist – young and old – will love this collection!